A one-page, payday loan application that applies to multiple lenders at once. The Payday Loan Search tool filters through our database of lenders based on price, reputation, ranking, and geography. Payday Lending is regulated by each state so our filters help you get to a lender quicker so you don’t waste time applying to lenders for whom you are ineligible. The payday loan finder filters direct payday lenders based on our Sniff Score, ranking, state, and lender type. The Sniff Score measures lender reputation based on state licensing, storefront presence, Better Business Bureau reviews, legal-entity location, and website content. Our ranking incorporates the Sniff score and pricing, i.e. a lender with a lower price can offset a lower Sniff Score. The state filtering selects only lenders providing payday loans to your state. Lender type selects either payday or installment loan lenders. 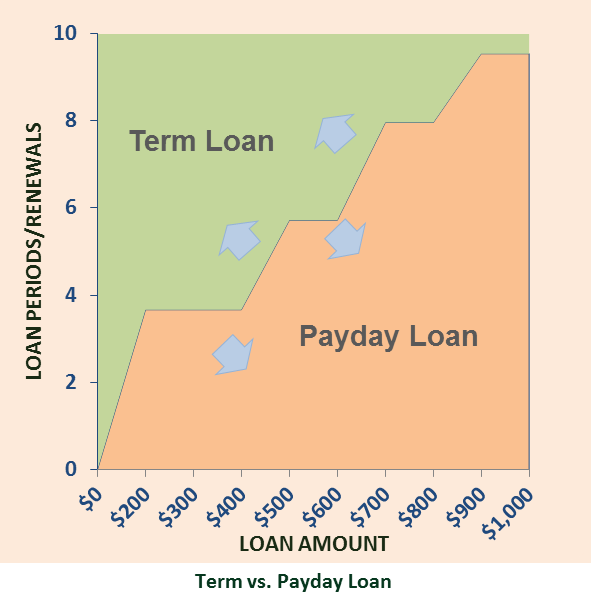 See Payday Loan or Installment Loan for more information on the differences between payday loans and installment loans. 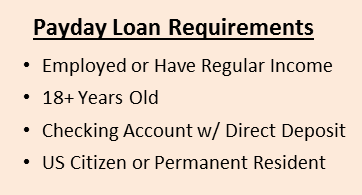 We now provide a payday loan application that gets you access to multiple direct payday lenders. We’ve partnered with T3 Leads and RoundSky so have as many if not more lenders than other payday lending sites. With this one application you can effectively apply to all our lenders at once. This saves you a lot of time by not filling out multiple applications or searching for lenders by state — we take care of this for you. Once you apply there is no obligation to take a loan. If you are approved by one of our lenders we will send you to their website where you can review the terms of your loan. Remember we have no control over the lender’s website or terms so make sure you understand everything before you take out a loan. If you choose to accept the terms money is generally deposited into your checking account the next business day. We hope you like these new services and you find them helpful. Please drop us a note if you have any question or lenders you would like us to review. Payday loan requirements are low because payday loans are not underwritten based on your credit history or available collateral. Loans using credit or collateral require additional information to evaluate credit history or to value your collateral. Instead, payday lenders are based on your ability to repay from your paycheck. Thus, payday loans are generally easier to get than other types of loans, such as Title Loans, Unsecured Personal Loans, or Credit Cards. There is no credit check with payday loans, so bad or no credit is okay, but payday lenders do check databases like CLVerify, Teletrack, or Accurint to verify your identy and other information you provide, so make sure what you put on your an application is accurate. The approval process for payday loans is fast. Approval is usually instant and cash can be deposited into your account the next business days. This convenience and simple eligibility makes payday loans an expensive form of borrowing when compared to credit-based borrowing, such as credit cards, but cheaper than other options, like bouncing a check or paying a utility bill late. Before taking a payday loan, make sure cheaper options are not available to you. See Quick Fast Loan Comparison for a comparison of different loan options and to determine if payday loans are the best source of cash for meeting your short-term needs. Applying for a payday loan can be done completely online and in less than five minutes using The Payday Hound provides a very, payday loan application. There is no faxing or scanning. We work with almost all of the top direct payday loan lenders. We submit your application to our lenders and if you are accepted, you will be presented with a loan agreement from the lender. Our application is 100% free to our users with no obligation. Once you are approved, you can choose to accept the loan terms or not. If you decide to accept, cash will be deposited to you account. 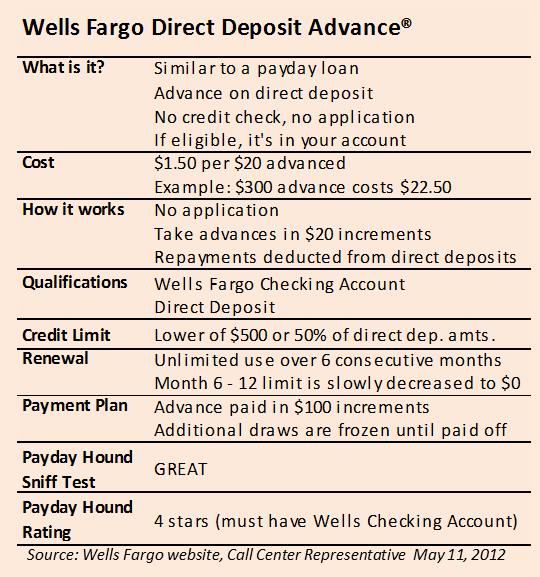 Wells Fargo recently entered the payday lending space with a new product called Direct Deposit Advance. The Payday Hound believes it is an aggressively priced product and a very good option to consider when looking at short-term, emergency funding options such as payday loans. It is only available to Wells Fargo customers. The pricing for the advance is $1.50 for every $20 advanced. For a $300 advance, this is $22.50. Since it's only for existing Wells Fargo account holders, there is no application or sign up process. If you have a qualified Wells Fargo checking account, it's already in your account and you can just choose to take an advance from it. The Wells Fargo team is very careful at making sure you realize this product is designed for short-term, emergency funding. Qualifications: A qualified Wells Fargo checking account in good standing that receives $200 or more in direct deposits a month. Qualified Wells Checking account: There’s fine print here, but generally if you have a basic checking account, you are good to go. The accounts that do not qualify include student and teen accounts. Other excluded accounts include Premier and Private Banking accounts (stinks for these guys). Credit Limit: 50% of average direct deposits over a statement cycle or up to $500. Usage: $20 increments up to your credit limit as often as needed. Fees are not counted against your credit limit. Repayment: Deducted automatically from your account whenever a direct deposit arrives. There is also a mail option that has a $100 set-up fee with a $35 late fee. Renewal: The credit limit is maintained for six statement cycles (about six months) during which time you can use it as often as you like. After six cycles the credit limit is reduced proportionately each cycle until it is to $0 by month 12. After one statement cycle, you can then re-apply. If you don’t take any advance and keep your balance to $0 for one cycle at any time during the first six cycles, the clock resets (i.e. you have another six months until the credit limit is decreased). Available States: Alaska, Arkansas, Arizona, California, Colorado, Idaho, Illinois, Indiana, Iowa, Kansas, Michigan, Minnesota, Missouri, Montana, Nebraska, New Mexico, Nevada, North Dakota, Ohio, Oregon, South Dakota, Texas, Utah, Washington, Wisconsin, and Wyoming. The product also has a neat repayment plan option. After three statements of consecutive months of usage, you can sign up for a repayment plan. 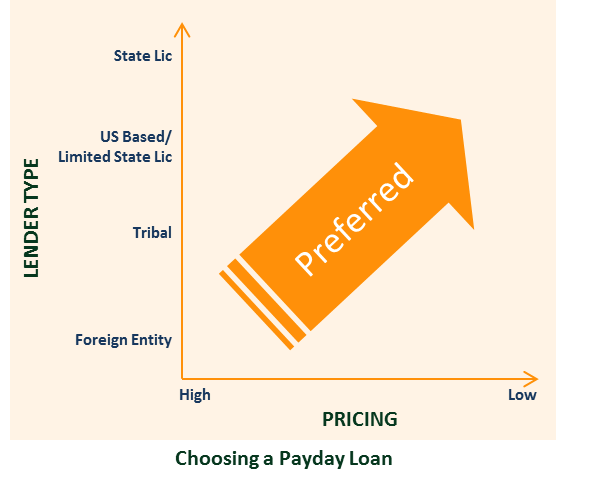 This basically gives you a free option to turn your line into an installment loan (See our Payday Loan versus Installment Loan analysis). To use this, you must have drawn down at least $300 in principle. Payments will be $100 from each direct deposit until the amount is paid off. While using the payment plan, no other advances can be made. This account does require you to have a Wells Fargo checking account. If you do not have a Wells account, you need $100 to open an account, which if you need an advance you probably don’t have. In that case you will need to try someone like CashNetUSA, Ace Cash Advance, or Check City. In calculating our costs, we did not include any fees associated with owning a Wells Fargo account. In most cases, if you are doing direct deposit, your checking account is free. There are other fees associated with a Wells checking account, such as ATM fees, but we feel these fees are related to another service not necessarily associated with this one and so did not include those prices. We also did not include the mail-in payment option. We focus on online options and feel most of our users will not opt-in to this option. The pricing of this product is aggressive and is a great option for short-term, emergency needs. A future post will look into how Wells Fargo is able to charge this rate while others are charging higher rates. The Payday Hound really likes this product for people who already have a Wells Fargo checking account in a qualified state. And apparently so do many others. The very friendly and helpful representatives said this product is so popular on Fridays that Fridays are informally known with their team as Direct Advance Fridays. Figuring out how to choose a payday loan can be complicated. In general, The Payday Hound choice is to find the lowest priced, state licensed lender. There are situations where going with a different approach makes sense. For example, there may be a lower priced non-licensed lender or there may be no state-licensed lenders in your state. In general, if you pay your loan on time, most lenders behave appropriately. Although there are recent stories of lenders that ignore requests to payoff your loan on time and automatically renew your loan subjecting you to additional fees but in general most problems come when you are unable to pay. Some lenders may work with you more while others may just continue to draw from your account and pile on fees. It is in this situation when a state-licensed lender is often preferable. In general, The Payday Hound suggests considering three areas when choosing a payday loan: lender type, pricing, and your state’s payday lending laws. There are basically four types of lenders online: state-licensed lenders, out-of-state lenders, tribal lenders, and foreign-based lenders. State licensed lenders are licensed by individual states and must comply with individual state laws. The second group is out-of-state lenders. Some out-of-state lenders are licensed in their state and export their laws into your state while other out-of-state lenders are not licensed in any state and thus, only comply with U.S. federal laws. Third group is tribal lenders. These lenders must comply with U.S. federal laws, but do comply with your state’s laws and instead export their tribes’ laws into your state. The final group is foreign-based entities. This group export their country’s laws into your state but basically are unregulated. Consider both APR and the total cost of the loan when evaluating payday or short-term loans. Payday loans are designed as short-term loans and are expensive compared to credit cards or bank loans but can be cheaper than bank overdraft or late fees. In any event payday loan fees can add up quickly to so make sure you understand the pricing and renewal terms of your loan. If the term of the loan goes beyond one or two pay cycles, the loan’s fees quickly accumulate. Some payday loan companies offer installment loans. These loans are not due in full on your next payday. Instead, payments are extended over a period of time such as eight pay periods. Each payment pays part of your fees and part of your principal until the loan is paid off completely. These term loans have a lower APR and loan payment but increase your total fees. They are a good choice if you need your loan longer than one payday cycle, but more expensive in terms of fees if you only need your loan until the next payday. See Payday Loans versus Installment Loans for more details. When choosing a payday loan, the state you live in will impact your options. Some states have effectively prohibited all payday lenders from operating while other regulate and license lenders. We prefer state-licensed lenders if they exist in your state, as the state helps to regulate their behavior. In some cases, non-state licensed lenders may have cheaper rates. In this case, you will need to evaluate whether you want to take the risk of going with an unlicensed lender in exchange for lower fees. The additional risks may be that they do not treat you fairly or are unscrupulous in their collection efforts. Other times, they may operate just as fairly as licensed lenders. The Payday Hound tries to weed out unscrupulous lenders using its Sniff Test, so look for OK to GREAT on the Sniff Test.